Over the years I have been to Angelina's dozens and dozens of times. I've been there for both brunch and dinner. The last time I was there was over a year ago. During that time, Angelina's has changed ownership. The new owners have renovated the restaurant and added a full bar. This past week I finally made a visit back to one of my favorite Seattle restaurants. I must say, I was very impressed with the renovation. The addition of the full bar is really nice. The look of the restaurant is more modern and clean. I was very excited to see one of my favorite servers still working there. I decided to order one of my favorite entrees I used to order a lot over the years, Chicken Picatta. I noticed that the entree no longer comes with a salad. This was no big deal as most restaurants nowadays charge extra for a side salad. When the entree arrived it looked very tasty. 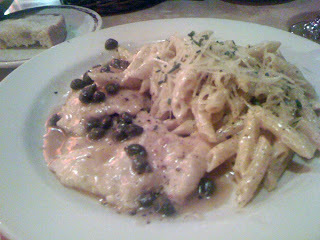 This Chicken Picatta tastes much better than those I have had in the past. The only thing I would change is the amount of capers on the chicken. I like the flavor capers give to the chicken and sauce, but I usually scrape them off and pile them up on the side of my plate. Next time I will just ask for less or no capers. Other than that, the meal was delicious. The pasta was cooked perfectly and had a generous amount of grated Parmesan cheese, which I love. If you haven't been to Angelina's since the new ownership and renovation, I highly recommend it.